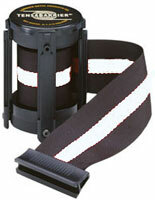 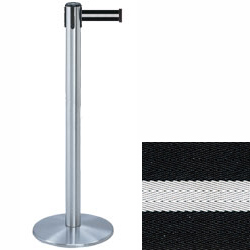 These chrome stanchions with white striped belt are constructed of strong metal with a weighted base for extra stability. 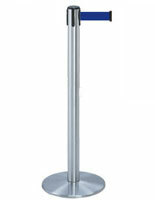 The floor standing posts are ideal for crowd control because they come with a 13' long retractable strap with an easy-to-notice design. 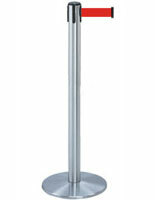 The chrome stanchions with a 13.5" diameter base are part of the Tensabarrier line and are compatible with addons such as sign holders and other straps. The metal floor stands cover a large area, meaning less posts are needed to form adequate crowd control. 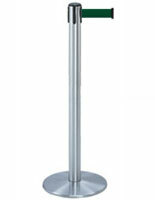 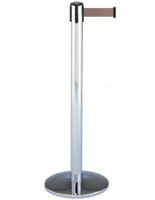 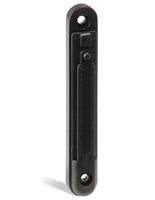 Stanchions like these are an excellent choice for coffee shops, event venues and hotels.